I'm less than thrilled with the color and overall photo quality, which is probably why I didn't post it last June, but it's my understanding that all I have to do is tell you that I used an Instagram filter on it, and then you have to like it regardless. Not really any Sheba news. There's been a lot of traveling in the last couple weeks, which is rough on her (she sometimes gets carsick), but she didn't actually get sick, so that was nice. I've gotten a couple new plants in the process, neither of which is particularly interesting (Sansevieria trifasciata 'Jade Dwarf' and Ficus benjamina 'Starlite' are my guesses, though neither one was tagged with a cultivar name), but at least they were cheap ($5 and $3-something, respectively). A lot more money went toward large (12-14" / 30-36 cm) clay pots: many up-pottings have been on hold for several months because I needed a couple really big pots, so I could free up a few sorta big pots, which would free up some medium-sized pots, and so on. Also questionable judgment but at least not terribly expensive: I've been working on a couple new plant profiles at once, for the "book" or whatever it's going to turn out to be, and I had forgotten about the problem where when I'm writing a profile, I tend to convince myself to get more of whatever it is I'm writing about. Worse, the search results for certain plants will bring up seed-selling sites, and you know how I am about seeds. So on Thursday, I discovered that I'd ordered 100 mail-order Leuchtenbergia principis seeds in some kind of seed-purchasing blackout. 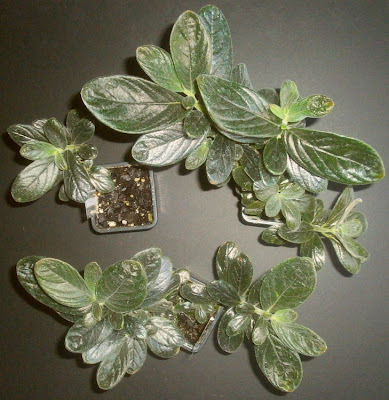 Question 1: Is it possible for fuzzy-leaved plants like Episcias to get scale? I've seen warnings about mealybugs on Episcia, and actual mealybugs on similarly-fuzzy plants, but I don't think I've ever seen anyone talk about scale on Episcia, Saintpaulia, etc. Does it happen? It seems like maybe the hairs would make it hard for them to sit on the stems and leaves like they like to, and I haven't seen any during the whole scale outbreak, is mostly why I'm asking. Question 2: What was happening here? 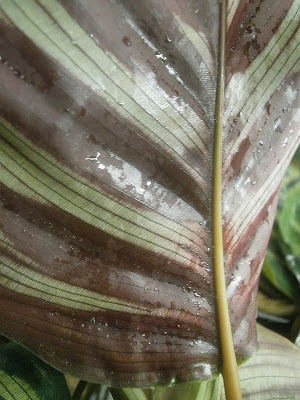 The Calathea makoyana had been doing fine for quite a while down in the basement. Then, about a month ago, I had it switch places with an Aglaonema next to it, because the Aglaonema was getting too tall. The Calathea then wound up directly under one of the shop lights. Two weeks later, when I went to water it, the leaves were curled and beginning to wilt, and the undersides of most of the leaves were full of spider mites and sticky spots like this. Thinking "sticky spots = scale," I checked the plant thoroughly, but didn't find any. So I put it back, in its old spot. Two weeks later, I looked at it again, and it looked like the above photo. Still didn't see any actual insects, just spider mites. And unlike the scale on the other side of the basement, the stickiness was only ever on the underside of the leaves, never the top. The plant was discarded anyway, on the grounds that several of its neighbors had detectable scale infestations, and that was long enough ago that I'm not upset about it now. But I am still wondering how I could have gotten scale without, as far as I can tell, getting scale. Question 3: How do you keep potted plants upright when outdoors? I intend to let some of the plants spend the summer outdoors again. The logical place for them to go is along the north side of the garage, which is shaded for most of the day but gets weak sun in the afternoon. Also the husband just poured concrete there, so it's a nice flat surface. The problem is that the wind comes sweeping in from the west, with basically nothing to block it, and gets funneled between the garage and house, so by the time it reaches the driveway it's moving really fast. Consequently, anything with a high center of gravity gets knocked over every time we have a storm. And we have lots of storms. Last summer, I had three basic approaches for dealing with this. 1) Put the pots really close together, so even if they catch the wind and want to blow over, they can't. 2) Put bricks on the rim and/or soil. 3) Keep the really top-heavy plants inside. Those kind of worked, but even so, I spent a lot of time righting pots, dashing out into the rain at 4 AM to rush a cart full of plants into the garage, and picking up shards of broken pots. So I'm hoping that there are better ways that I haven't thought of yet. There is a plantable bed next to this spot, so it might theoretically be possible to plant something cheap or fast-growing to serve as a windbreak (currently, all that's there is grape hyacinth, Muscari something, so there's room), but all we actually have right now are a ton of Cannas and a random bunch of two- or three-year-old seeds. 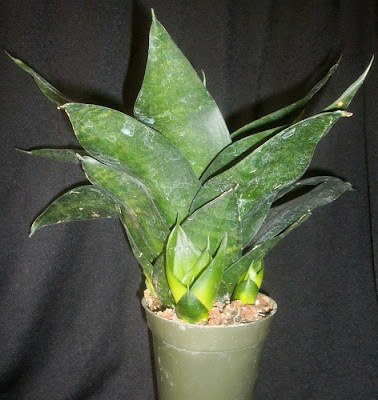 Question 4: Are there ways to force Agaves to offset? Or even ways to encourage them to offset? 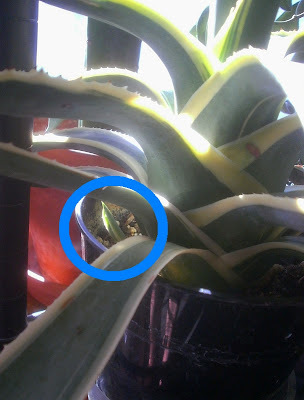 I ask because there was a spell in January when a bunch of Agaves I had all started to offset at once. It could be coincidence, of course, but a couple of the offsetters in January had never even done it before, so it seemed like there was a connection. If I did something to cause it, though, I don't know what that was. Does anybody have any idea how that works? This year, I was avoiding the sale tables, because . . . I dunno. It feels weird to take photos, especially if I'm taking photos without buying anything. Also they're only tagged sometimes, which is obnoxious, and there are usually a few people standing across the table from me when I take the pictures, and even if they don't say anything or aren't paying any attention to me, it still feels awkward. But I made an exception for this one because 1) it was tagged, and 2) it was unusual. Of course, it also sort of reminds me of the Exotic Angel logo. And the lighting was crappy. But whatever. I tried. But they're interesting, and the floral displays get a lot bigger than this. 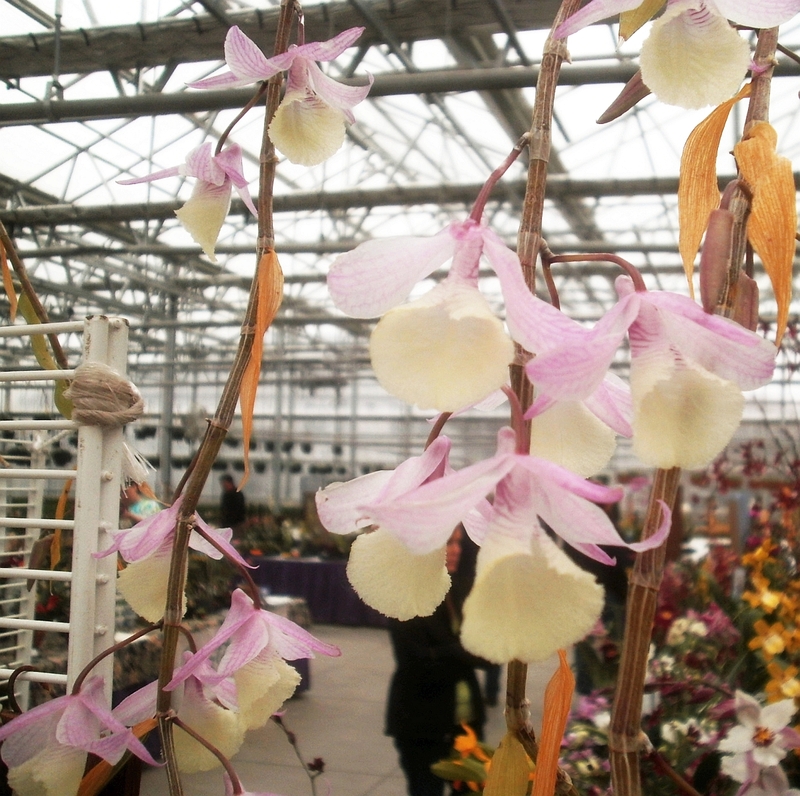 I found a good blog post on "pendant" Dendrobiums here, which is highly recommended, if only for the photos. The D. pierardii photo must have at least 200 individual flowers visible. 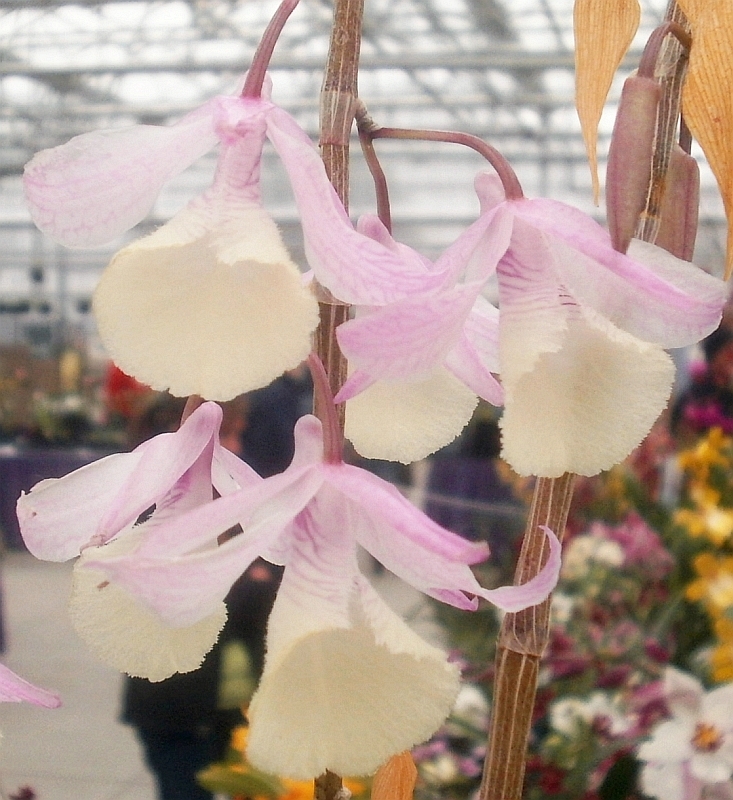 And D. wardianum has some fine-looking flowers as well. The first bit of unfinished business that I should bring up is the announcement I hinted at last Monday. I am really, no fooling, finally in the process of writing a book, as of Wednesday night. I am doing it entirely wrong, of course. I have no idea whether it will wind up being a book. I have no publishing deals. I've not even talked to any publishers since a couple years ago, nor are there any plans to do so soon. And I don't know whether it will ever be for sale as a self-published thing either. I also don't know how long it's going to take me to write or how long it will be. Basically, I have no idea what I'm doing at all. But the thing is: I have been intending to write something for a very, very long time now. You're surely tired of hearing me say this; I'm definitely tired of saying it. And I haven't been writing anything, all this time, because I've been trying to get everything lined up properly in advance. What do I write about? How shall I format it? Should I try to write a book proposal up for a real publisher, or plan on self-publishing? Etc. As of Wednesday, I am officially no longer caring about any of that. Those are not fun things to think about, and I don't know how to make those decisions with the information I've got at the moment anyway. So I am going to write a thing, and then I will try to decide what to do with it after that. At this point, I'm only planning to do plant profiles, and I have twenty-one candidates.1 Probably not all of those are going to happen, and others will turn into something else. Also I might well give up on the whole idea before finishing any of them, but: what little vision I have of the future is currently revolving around those twenty-one plant profiles. For whatever it's worth, I'm starting with Madonna. I'll eventually set up a progress page or sidebar or something to let you know how it's going. I do not know, at this point, whether this is going to affect blogging frequency or quality. The hope is kind of that writing the profiles -- which I always used to enjoy, however much I also complained about them -- might make me more excited about, and interested in, plants again, so you may not notice a difference. And now some plant-related content. The near-perfect pentagon formed by the leaves of the Columneas wasn't planned; I didn't notice it until after I uploaded the photos. A few of the Columnea orientandina seedlings I started last summer are still with us, though most aren't -- I transplanted twelve pots' worth of C. orientandina seedlings, I think, and only three of those still contain living plants. Eight of the remainder got too dry or too wet or both; one got thrown out because of scale. I've started two additional rounds of seedlings since then, but the sprouts are so tiny and stringy when they first emerge that I'm scared to handle them. Consequently, I haven't transplanted them yet, and they're probably going to die before I can psych myself up to do it. In the future, I'm going to try starting them directly on soil, rather than trying to start them in vermiculite and then transfer them. If it works, then I don't have to worry about hurting them during transfer, and if it doesn't, well, there will be more seeds later. Though it sort of doesn't matter anymore, since the seedlings in those three pots are large enough to take cuttings from. I don't have to start them from seeds if I don't want to. For all intents and purposes, I won't be selling or trading plants in 2013. It's the whole scale-and-thrips business, mostly: the worst of that seems to be over, but I don't know if I've actually gotten them all. There are other reasons too (mailing plants is a big time drain; sometimes people are supposed to pay for their plants and then don't; I don't always know what I'm going to get when I agree to a trade), but not wanting to mail bugs to people is the main thing. And anyway, I supposedly have a new project now; see above. 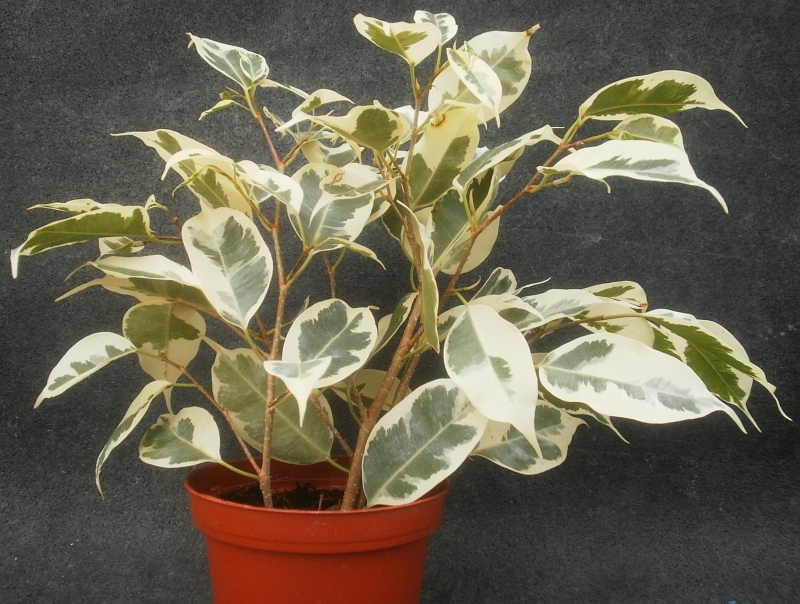 Having said that, I'd now like to undercut it by saying that if you've seen a plant on PATSP that you're desperate to have, and you've checked the "Plants I've Tried" list and I'm still claiming to have one, feel free to e-mail and ask about it. (Especially if it's something I've talked about offering for sale in the past.) I'm not going to try to be all organized and official about selling and trading this year, but there are still a few plants I could send out, and maybe a few plants I'd be interested in bringing in, so we'll see what happens. If you're looking to trade, you should check out the "Plants I Want" page first, because there's a whole big list there at the bottom, of plants I am definitely not interested in, and checking that could save us both some time. 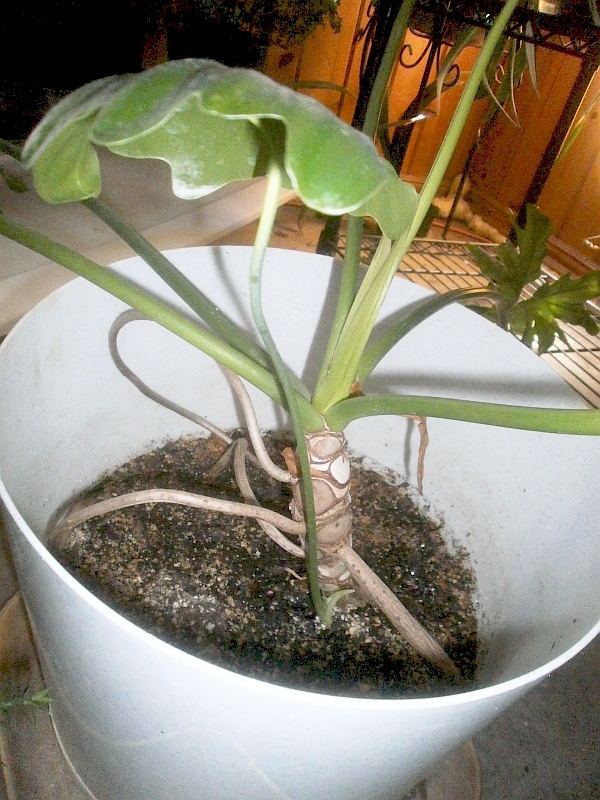 The Philodendron bipinnatifidum sucker is still there. Not growing very quickly, but still there, and the parent plant keeps getting bigger (very slowly), so I guess it didn't signify anything bad. The poor plant has been terribly, terribly abused, so it's a wonder it's even still alive, never mind growing and self-propagating and all that. Euphorbia milii 'Candyland' eventually succumbed to the Euphorbia-ravaging fungus. The leaves kept fuzzing over. I pulled them off, but it kept happening. I tried spraying with various things. It kept happening. Finally, in frustration, I cut the top off the stupid thing. The theory was that if there weren't any leaves to infect, the fungus would give up and go home. Instead, the plant got upset about being beheaded, and rotted, and I wound up throwing it out anyway. Oh well. 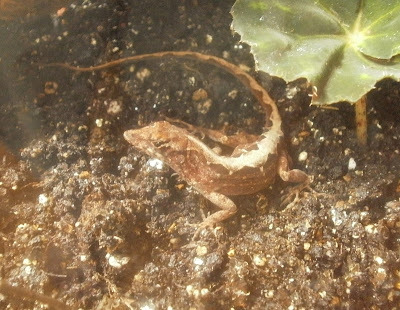 The Excoecaria cochinchinensis lasted until February 2013, so not quite a year. It wasn't dead, and I didn't have a strong recurrence of spider mites (there were occasional small infestations), but it had dropped a lot of leaves, it wasn't replacing them quickly, and it had gotten floppy in a way that was inconvenient. I could have let it stay if it had continued to be pretty, but it wasn't even doing that, and this was during the spell when I was trying to get rid of a bunch of plants I didn't like anymore, so out it went. The Hatiora with magenta flowers is still around, but it obviously hates it here. Only two of the original four salvaged pots are still around, and one of those just shattered because I moved it up to a bigger pot. Also it's never rebloomed, though that's probably because it's in the basement, where the days are always too long for it to set buds. And now I'm like 0 for a billion, on Crassulas. This was the one Crassula that was halfway working for me, but then I had to move it out of the south window because it got too big, which it didn't like. Then in the late fall I dropped it, or something fell on it, or something like that, and the main stem broke off. The remaining branches grew for a little while after that, but since they weren't getting the same amount of sun, and the plant was taking up water more slowly (both because there was suddenly a lot less plant there and because it was colder), they eventually wound up rotting. So I'm just done done done done done with Crassulas. They have nice qualities, but they're not well-suited to what I can do here. I'd list the plants that go with those, but at the moment, I'm thinking I'd rather not give too much away in advance. Even if I gave you a random-order list of the plants involved, some of them are obvious enough that you'd be able to figure them out, ruining the surprise anyway. So for right now, I'm not going to say which plants, other than to note that two of them are plants I've already written profiles about, but I think I can improve on those so I'm going to attempt to write them again.